1. How has the Maker's Mark Secretariat Center set the standard for Thoroughbred Aftercare? Over the last 5 years, the awareness of the issue of aftercare has grown. The industry is doing so much more to support Thoroughbreds once their racing careers are over, and many new non-profit and for-profit organizations dedicated to the rehab, reschooling, and rehoming of off-track Thoroughbreds have blossomed. Within this movement, the MMSC has chosen to focus on quality and depth of training, as well as a dedication and exigence to matching its horses with the ideal potential adopter. Our focus is horse-centric, and we pride ourselves on addressing each animal’s needs, however long that may take. 2. Thoroughbreds often have very short careers and it is important to have a backup plan when they cannot race anymore. What do you believe is the best way to help these Thoroughbreds continue to have a purpose and fulfilling life? This is a complicated issue and needs to be addressed on several fronts. First, education. All Thoroughbred owners and breeders, especially those who are new to the industry, need to understand the responsibility and necessity of caring for a horse if and when it no longer has a career on the track. This awareness must occur at the onset and prior to undertaking ownership of a racehorse. It must be understood that it comes with a moral commitment to aftercare. In this way it is similar to having and raising a child. Moreover, trainers must be educated about the need and value of retiring horses from their racing careers before they are utterly broken down. In this regard, the Retired Racehorse Project’s directory of the numerous aftercare organizations in existence in the United States today is a tool that should be readily available and indeed distributed at every track in the United States. Second, proper funding. It is no surprise that horses are expensive at best and even at the very least require care and nurturing for subsistence. This is a price that could and should be born not only by the owners and breeders, but by everyone within the racing industry, including those who wager and those who enjoy going to the racetrack for pleasure. The industry needs to be commended for the initiatives it has already undertaken, such as the Jockey Club check-off program, the Thoroughbred Incentive Program, the allocations of a small portion of the handle that certain tracks are making to various organizations such as the TAA, etc. While all of this is encouraging, this movement needs to build and as awareness and public pressure grow, no doubt funding will grow too. 3. How is the MMSC constantly improving its Aftercare program? With the rise of numerous reschooling organizations and efforts going on around the country, it is imperative for the MMSC to amend its program continuously so that it meets the needs of the horses. 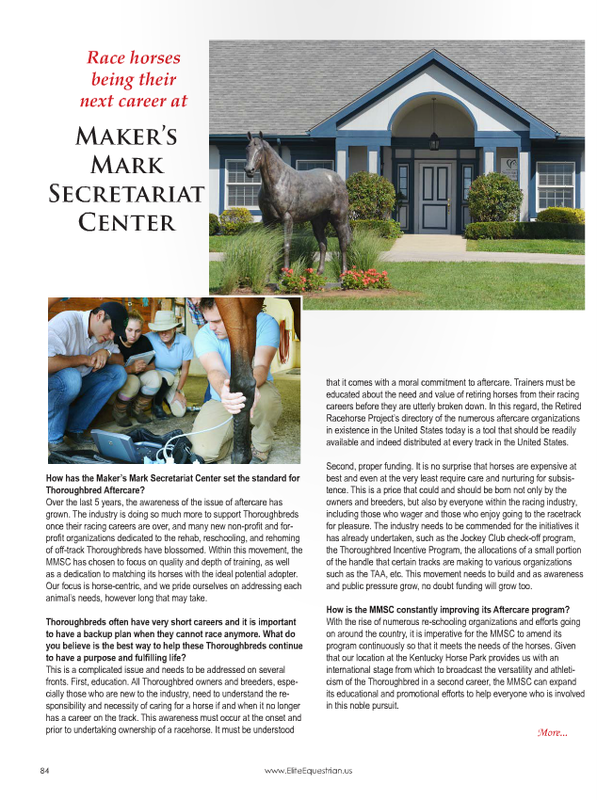 Given that our location at the Kentucky Horse Park provides us with a unique and an international stage from which to broadcast the versatility and athleticism of the Thoroughbred in a second career, the MMSC can expand its educational and promotional efforts to help everyone who is involved in this noble pursuit. 4. What are the long term goals for the Maker's Mark Secretariat Center in 2016? The long-term goals for the MMSC are as follows: 1) To procure additional land where horses coming directly off the track can have a period of rest to recuperate before transitioning to a new career. 2) A covered or indoor arena, so that reschooling and training efforts can take place year-round. 3) To acquire a secure base of funding that will cover the needs and costs of the horses and ensure the longevity of the MMSC and all of its programs. 5. How can an interested adopter learn more about the Maker's Mark Secretariat Center? An interested adopter can go to our website, our Facebook page, our blog, call us directly, and/or visit. We are always happy to answer questions, to talk about our program, and to show off our facility!